Gamers who purchased Dark Matter from GOG prior to October 21 are being offered their money back, while Steam has stopped selling it outright. The Dark Matter saga has been an ugly one so far. The crash course catch-up version, for those who haven't been paying attention: Indie developer InterWave Studios ran out of money and so released an abbreviated Dark Matter without a proper ending, acknowledging that it was "indeed not complete" but then later claiming that it actually is "complete," just not all they'd hoped to make; then publisher Iceberg Interactive got involved and said the studio had been misquoted and that the game is actually intended to be just the first part in an "episodic series," even though absolutely nothing about an episodic release had been mentioned by anyone prior to that moment. The bottom line is that the game doesn't end properly and players aren't happy about it, and with InterWave seemingly unable to do much about it beyond clarifying that the end is the end, GOG has decided to handle things itself. "It's come to our attention that the gamecard for Dark Matter was not quite specific enough about the nature of the game and, as a result, it may be that some people bought the title with some misapprehensions as to how the game's story would end," GOG marketing guy Trevor "The Enigmatic T" Longino wrote. "If you bought Dark Matter before 21 October 2013 at 15:00 GMT (when we updated the description to where we feel it adequately reflects the game) and you feel that the game wasn't as promised to you, please contact Support and they'll be happy to offer you full refund to your card or, if you'd prefer, games of equal or lesser value to the sale price of Dark Matter (which is $13.49)," he continued. "We're sorry if anyone who bought the game isn't happy with the way it was represented, and we hope this makes it right for you guys." 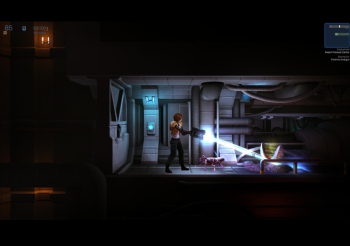 While the GOG entry for Dark Matter doesn't specifically address the abrupt "wall of text" ending, it is now described as "the first half of a thrilling, gripping story spanning 14 areas of deep-space survival." Steam, meanwhile, has halted sales of the game outright, replacing the purchase link with a message stating, "Currently there is a known issue at the end of the game. The developer is aware of the issue and they are working on a patch as a solution."